Since 1973 over 60,000,000 babies have been ripped from their mother’s womb. With the technology of today it amazes me that someone can’t see that abortion is taking a life. That is more than a “fetus” in a women’s womb, it is a life that God has given. Interestingly, the Bible records that John the Baptist leaped in the womb of his mother, Elizabeth, when Mary announced to her she was bearing the Christ Child (Luke 1:41), clearly indicating the child she carried was a life. Every person who values the sanctity of life ought to in brokenness weep over the despicable and inherently evil Reproductive Health Act signed into law recently in New York that allows abortions up to the very minute of birth. Legalizing the right to kill a baby up to the moment of birth, the New York governor praised the passage of the legislation, calling it a “giant step forward.” Of course, abortion advocates are applauding and rejoicing calling it a “great day.” No, it is not a giant step forward or a great day, it is a giant step backward and a sad day. It is a horrifically sad day when taking the life of a baby is celebrated with such jubilant exuberance by supporters of this legislation. Mother Teresa once said, “A nation that kills its children in the womb has lost its soul.” America has lost its soul. We have become a culture of death. 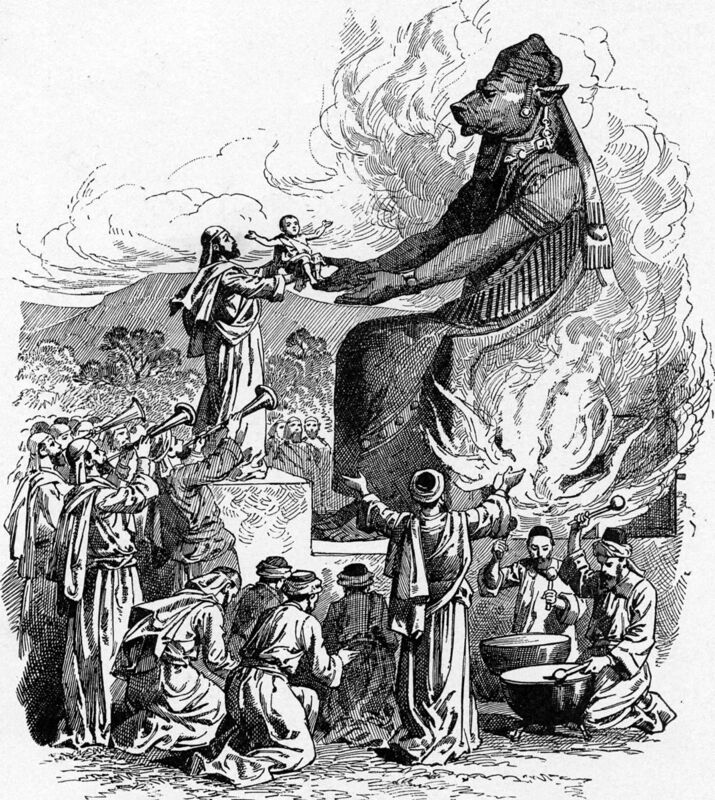 Americans in their obsession with support of abortion have reduced themselves to the level of the barbaric pagan Canaanites who worshiped the god Moloch which was associated with child sacrifice. Such legislation as seen is New York is akin to modern day worship of Moloch. We are all familiar with the phrase “wailing and gnashing of teeth.” Coming from the very lips of Jesus, what was He referring to when using such vivid terminology? In the Parable of the Sower in Matthew 13 Jesus is explaining that the wheat (genuine believers) and tares (false believers) grow together, and when the harvest is come the tares, whom He calls “children of the wicked one,” “are gathered and burned in the fire.” Of that harvest day Jesus states, “The Son of man shall send forth his angels and they shall gather out of his kingdom all things that offend and them which do iniquity, and shall cast them into a furnace of fire. There shall be wailing and gnashing of teeth” (Matthew 13:41-42). Jesus in his picturesque words was alluding to a horrific practice which would have conjured up terrifying images in the minds of His hearers. One of the pagan gods of the ancients was the god Moloch/Molech, which in the Jews past had crept into their worship being introduced by evil kings. The worship of Moloch involved child sacrifice. The huge, hideous looking idol was made of metal, shaped as a man with a bull’s head. The gigantic idol had a hole in the abdomen and outstretched arms where a child could be placed. A blazing fire was lit in and around the metal statue. By offering a child sacrifice to Moloch it was believed that it would bring financial prosperity to the home and future blessings. Babies would be placed in the statue’s arms or they were placed in the furnace-hole. If a child was old enough to walk, they were forced by using whips to drive the child into the white-hot fire, all the while listening to the horrid cries of the children, the “wailing and gnashing of teeth.” One can only imagine the horrible shrieks and painful screams of those innocent children as they were forced or thrown into the fire, the “wailing and gnashing of teeth” would have been indelibly burned into the minds of those who witnessed such terror. What a horrid picture Jesus painted by using that phrase. May I say the legislation that New York has recently enacted as law is just as evil, pagan, barbaric and horrific as the scene Jesus was painting for his hearers in Matthew 13. We are repulsed at such barbaric paganism of the child sacrifice involved in worship of Moloch, but our culture is not repulsed at the neo-paganism of laws that permit the snuffing out of a child’s life up to the moment of birth. While those who gleefully applauded the passage of legislation that will allow the murder of a child to the very moment of birth are deaf to the “wailing and gnashing of teeth” of all the innocent victims that will be sacrificed, it behooves caring Christians to hear those cries and earnestly pray for ears to be opened to stop this evil madness. And may I say, those who support such barbaric legislation the day will come when they will hear the very cries which they have inflicted. By embracing the destruction of life, we are inviting consequences upon ourselves that will not be escaped. American society continues to dive deeper into the cesspool of death, destruction and perversion, gleefully thumbing their noses in the face of a holy God. Morally we as a nation are moving in the wrong direction. “Righteousness exalteth a nation: but sin is a reproach (disgrace) to any people” (Proverbs 14:34) …and the nation that forgets God is turned into hell (Ps. 9:17). Oh, how we need across our land today genuine repentance and to pray for a culture that once again will embrace respect for life and value the God given right to life. Only then can we hopefully avert the consequences of our atrocious actions. May God have mercy upon us.